Ecosystem services are the resources and processes supplied by natural ecosystems which benefit humankind (for example, pollination of crops by insects, or water filtration by wetlands). They underpin life on earth, provide major inputs to many economic sectors and support our lifestyles. 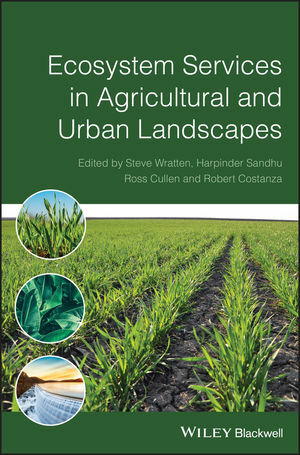 Agricultural and urban areas are by far the largest users of ecosystems and their services and (for the first time) this book explores the role that ecosystem services play in these managed environments. The book also explores methods of evaluating ecosystem services, and discusses how these services can be maintained and enhanced in our farmlands and cities. This book will be useful to students and researchers from a variety of fields, including applied ecology, environmental economics, agriculture and forestry, and also to local and regional planners and policy makers. Steve Wratten is Professor of Ecology at Lincoln University, New Zealand and Deputy Director of the Bio-Protection Research Centre there, one of the country’s Centres of Research Excellence. He has studied or worked at the universities of Reading, Glasgow, London, Cambridge and Southampton, UK. He holds three doctorates and is an elected Fellow of the Royal Society of New Zealand. His research focuses on evaluating and enhancing ecosystem services in agriculture, especially the biological control of pests, pollination, and below-soil processes. Harpinder Sandhu is a Research Fellow in the School of the Environment, Flinders University, South Australia. His research focuses on ecosystem services in managed landscapes. Harpinder also works on poverty-environment interactions in developing countries with their implications for equitable and sustainable development. He is also interested in land use and land cover change and its impact on biodiversity and ecosystem services. Ross Cullen has taught and researched at Lincoln University, New Zealand since 1991, as Professor of Resource Economics. He is an Editor of the Australian Journal of Agricultural and Resource Economics. His current research focuses on management and evaluation of biodiversity projects, ecosystem services in agriculture and forestry, and public perceptions of the state of the environment. Robert Costanza is Professor and Chair in Public Policy at the Crawford School of Public Policy, Australian National University, Canberra, Australia. His transdisciplinary research integrates the study of humans and the rest of nature to address research, policy and management issues at multiple time and space scales, from small watersheds to global systems. He is co-founder and past-president of the International Society for Ecological Economics, and was chief editor of the society's journal, Ecological Economics from its inception in 1989 until 2002. He is founding editor-in-chief of Solutions (www.thesolutionsjournal.org) a new hybrid academic/popular journal.